Kengo Kuma doesn’t shy away from incorporating the contextual signature material of a locality into his contemporary designs. 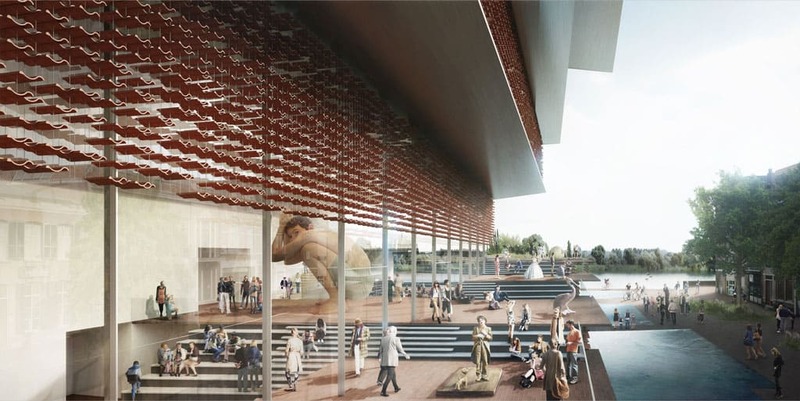 For the ArtA Cultural Centre, a competition that featured firms like BIG, SO-IL and NL Architects; he wrapped his proposal with a screen of red clay roof tiles. The city’s goal was to bring together a museum and the Focus Film Theatre in one building with a keen interest to reactivate the residents’ relationship with the Rhine River. Kengo Kuma responded to this brief by providing a building with two faces – one that merges with the streetscape and the other that cascades towards the river. The building in many ways extends the public piazza right from the street by offering stepped platforms that frame new vistas of the Rhine River. Moreover, it heightens the dialogue between the visitor and the waterscape ahead by introducing pools of water that in a matter of speaking bring all these seemingly fleeting elements into consciousness. So the façade facing the city centre is in terms of scale a typical urban block – with a double volume at the entry plane and straightforward levels. On the river’s edge, however, the building is a series of jagged terraces that bring in individual panoramic experiences for the subject at a more comfortable human scale. With the introduction of green terraces and waterscape along Newstraat, which can be perceived as a ‘community garden’ within the urban context, the architecture takes here a ‘landscape form’ relating itself, thus, to the river and to the landscapes surrounding the area and the city. Most successful architectural designs usually feature a space that brings all the major programs together. This space is sometimes as important, if not more important that the master spaces. In this ArtA Cultural Centre proposal, it would have been easy to clearly demarcate the museum functions to the Focus Film Theatre functions. Instead, the design is done in such a way that these main functions spill into one another creating the heart of the design: the Art Square. Other servant spaces such as lecture rooms and artist-in-residence studios are arranged around the Art Square. Whereas such a space would have obviously been a lobby, it serves not only as an essential linkage but also offers flexibility for multiple functions. The filigree of red clay roof tiles responds to interior functions of the building. With the permanent collection of the museum being located at the topmost level, the sun shading screen densifies towards the top. The Art Square at the ground level on the other hand calls for lots of daylight, so consequently the screen is sparse and excluded altogether in this level. It is interesting to note that third floor is punctured on one end to create a double volume space for temporary exhibitions that would require such a scale. The film functions are majorly placed on the lower floors. With the building likely to be used at night for film screenings, it became necessary to make these spaces easily accessible from the ground level. Towards the river, an extensive stairway serves both as a passageway to the river deck and as an amphitheatre. For special events, people could sit here and watch a movie being projected on a floating stage on Rhine River! An interplay of levels and voids creates interesting opportunities for diagonal views from various part of the building. This is probably what makes this proposal successful in its own right – despite it not being the winning entry; that it engages the subject in intriguing ways to experience the program, the city and the river simultaneously.